Last Friday, my friend and I went to the Jane Eyre 1:30 matinee with about 3 dozen retired women. 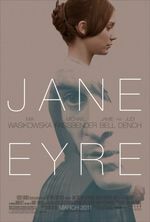 Going to a film like Jane Eyre during off-hours introduces you to an odd & immediate fellowship; strangers’ unsought confessions (“I love Jane Eyre so much, I even went to see Jane Eyre the Musical!”) are met with sympathy, rather than alarm. As to the movie, it was a solid adaptation. The film’s poetically shot (director Cary Fukunaga is also a cinematographer). We both liked Mia Wasikowska’s Jane, and have new obsessions with Michael Fassbender. The supporting cast was excellent (Judi Dench! Sally Hawkins!) and I loved some of the updated dialogue. At the same time, we were bursting with criticisms–simply, it was too short, too much was cut, and even though we were prepared for that, we did not like how the cutting was handled (see below the cut for more detail). But we are totally buying the DVD. 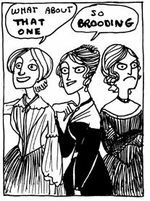 At right: If you haven’t read Kate Beaton’s riff on the Brontës, do it. Before I went, I’d heard some rumblings about the two lead actors’ lack of chemistry. Having seen the film, I don’t agree. Or at least, I don’t blame the actors for the missing romance. I blame more writing/directing/editing decisions that made the central romance less effective and cohesive than it could’ve been. First, it wasn’t properly developed at the beginning; we have two intellectual sparring matches (both exceptionally well-done) between the leads, but no scenes demonstrating a growing tenderness between the two. Then, boom! Rochester’s bed goes up in flames, and he puts the moves on Jane. The result is that Rochester seems less lovestruck and more predatory (like he needed any help there). The handling of Blanche Ingram was muddled; I got little sense of her or why Jane would feel threatened by her. One scene’s dialogue was changed (“my lovely one”), further undercutting Blanche’s role & Rochester’s fuckwittage. Finally, the ending reconciliation (one of the best parts) was almost completely eliminated. Even with time being an issue, I don’t understand that artistic decision at all. But I’m still buying the DVD.